I’m going to round up a bunch of audio discoveries I found at NAB 2012. Some for dslrs and some for iphones. Que Audio: First off, the video above is recorded into a Sony NEX7 with a Que Audio mic. This mic is very tiny and will fit into your camera bag along with the rest of your gear and still leave room for lunch. It’s a shotgun mic that’s about the size of a pen yet sounds pretty good. They are packaged in a variety of kits, from a bare-bones mic with shock mount on up to kits with booms and stands. The video was shot in a very noisy convention hall but the voice is still clear. Rycote: Rycote has three items that news shooters will be interested in. First is a shock mount for your H4N or Tascam DR40 recorder so you can put it on top of your camera and reduce the handling noise. In the company photos the mount looks big but I’m pleased to report it’s not so big in real life. Wind muffs for your built-in mics. 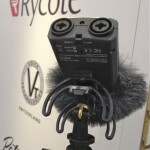 The next Rycote goodie is their Invision Video shock mount. This is designed to hold shotgun microphones, but it will also clamp onto your Sennheiser MKE400 mic, even after you’ve broken the little shock mount on it. This mount is a great solution to those little rubber legs breaking off. 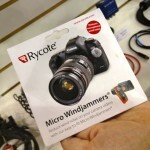 And finally, a must-have accessory for your DSLR or your iPhone is the Rycote micro windjammer, which is a little dot of furry wonder to cut the wind noise from your built-in mics on your camera or phone. These are semi-disposable, and stick on with a little circular pad to cover the mic. These work. 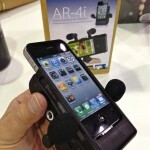 iPhone audio: This is a new subject for most manufacturers, but several iPhone audio solutions were at NAB. First was from Mic-W, a Beijing-based company making iPhone mics for mobile journalists and musicians. They have a range of shotguns and lavs that plug directly into an iPhone. The video above was recorded into an iPhone 4s with a Mic-W lavalier mic while he talked about a shotgun mic that plugs directly into an iPhone. Fostex with the AR-4i has updated their microphone mount for iPhones so that it now works with an iPhone 4s – or at least that’s what the folks at Location Sound told me, as I didn’t get to try one. Your iPhone goes into this contraption and you get two external mics and a bunch of jacks. I’ll look for Rode and report back. This show is overwhelming! Do you know of an inexpensive, low-noise, portable mic preamp suitable for use with the iPhone on an oral history project? I have tried the KVConnection cables with my Electrovoice RE/50 mic, but found the iPhone’s preamp too hissy for use in a quiet room. I’m hoping that some company will use NAB to launch a simple iPhone dock connector preamp. Inexpensive and low noise are contradictory. Rather than an iphone, I’d look at separate recorders.